After a successful Bank Holiday building flat pack furniture, I decided that I would get proactive on all the other little jobs around the house. You know the ones. The loose this, the broken that, the “in need of oiling” the other. They’re the jobs that are mentally scheduled for completion “at some point” largely because not doing them won’t cause the collapse of the Cotgreave family as we know it. However, I know that attending to them will have a positive impact. I made a list. It turned out to be a big list but compiling it felt like defragging a hard drive! Suddenly all the little-fragmented jobs, thoughts and wishes were on one sheet of A4 paper. I was in control! What’s more, over dinner with some friends I was heartened to discover that the mental to-do list is a commonality shared by everyone … and not just at home either. Professionally, we are a friends group drawn from diverse fields and backgrounds but each had a similar list of work “stuff to-do” that got put off because it wasn’t urgent. A software system that was functional but past its best, a concrete warehouse floor that needed resealing and repainting, a siloed IT architecture that worked but needed syncing across the business, an employee with a negative attitude, PCs that took longer to boot up, a hole in a reception wall covered by a painting, a car park with faded yellow bay markings, an upgrade from XP (!!! ), adoption of cloud technology, a new water boiler to replace the kettle in the canteen … the list went on. What struck me was how many of the things could be categorised as IT issues. IT is the lifeblood of most organisations now, yet many businesses only attend to flashing red alerts. The silo issue is a common one. There still are many IT management systems that simply cannot operate with any other system, creating disparate islands within their organisations. Priorities and goals on these islands are often not aligned with those of other departments or, even worse, those of their parent business so they are effectively operating as individual business entities. However, nothing gets done because the system kind of works. Each silo achieves its own goals and targets and the business as a whole does too so … why fix what’s not broken. Of course, companies that do break down these silos enjoy greater benefits from the free cross-departmental flow of information, broader teamwork, more efficient practices, and operational Service Level Agreements (SLAs) that align IT service requirements with enterprise business case. The advantage list is a large one, but rarely is the breaking down of silos a red alert issue – it’s usually on that “at some point” schedule! Other things on the “stuff to do list” are not flashing red right now, but you know that there is an unspecified point in the future that they will be and you will then be firefighting. Take the XP upgrade. Microsoft were clear about when they would be withdrawing support for Windows XP, 8th April 2014 was a date that many of us diarised but it took the “WannaCry” bug for many organisations to even start making plans to migrate. I understand this. Some clients, having found that business vital software and apps would not work on newer Operating Systems opted to stay with XP and hope for the best. Ironically, despite XP attracting much of the early blame, data seems to show that “WannaCry” actually targeted and took down later iterations of Windows. Actually, this only emphasises the importance of keeping patches and security up to date, however, it remains a non-urgent job for a lot of firms because the PCs turn on each morning and they function! Which is great, until the day that they don’t. So, ultimately, it can be those little non-urgent things that really slow you down. At worst, they throw a huge spanner in your works one day or, at best, they just nag at the back of your mind diverting focus away from the important stuff. How often have you been mowing the lawn and suddenly remembered the leaky tap, the unpaid gas bill or the subscription that needs renewing? In business, the effects of distractions like this are likely to be more harmful than wonky lines on a lawn. Employee motivation, profit, business efficiency, and strategic goals can all suffer when the little things add up. 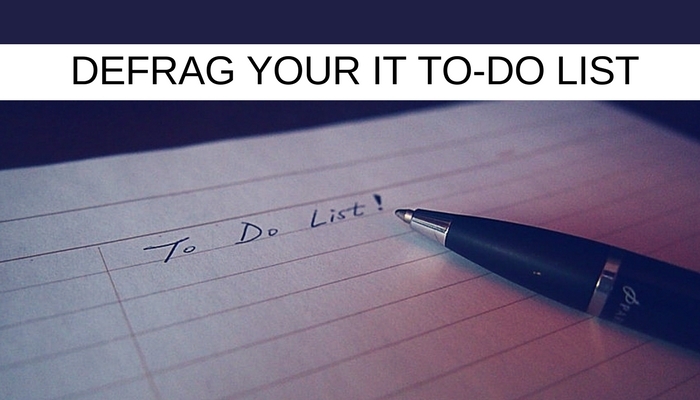 Taking care of the small stuff really is like defragging your hard drive, similarly, that’s not a high priority task but your drives usually work more efficiently afterwards – you will too! Of course, most PCs defrag automatically now, on a schedule, how good would it be if there were a similar light touch option for defragging your “to dos”? The good news is that the IT “stuff to do” list has an ally that the guys with the faded car park lines or dusty warehouse floor do not. The Project Management as a Service (PMaaS) industry is geared up to deliver what you need, when and for how long you need it. IT advisory and IT assessments have evolved to measure gaps between the service level your business goals require from IT and your current capability so they can prescribe tailored solutions. Don’t sweat the little stuff but still get the rewards of getting it done.